Virgin coconut oil (VCO) is extracted from fresh coconut milk and is 100 percent natural. It is unrefined, unbleached and cold pressed. Unlike other coconut oils that are extracted through heat, virgin coconut oil does not possess the odour of latik instead it smells wonderfully coconutty. Virgin coconut oil is considered as one of the most healthy and versatile of all vegetable oils. 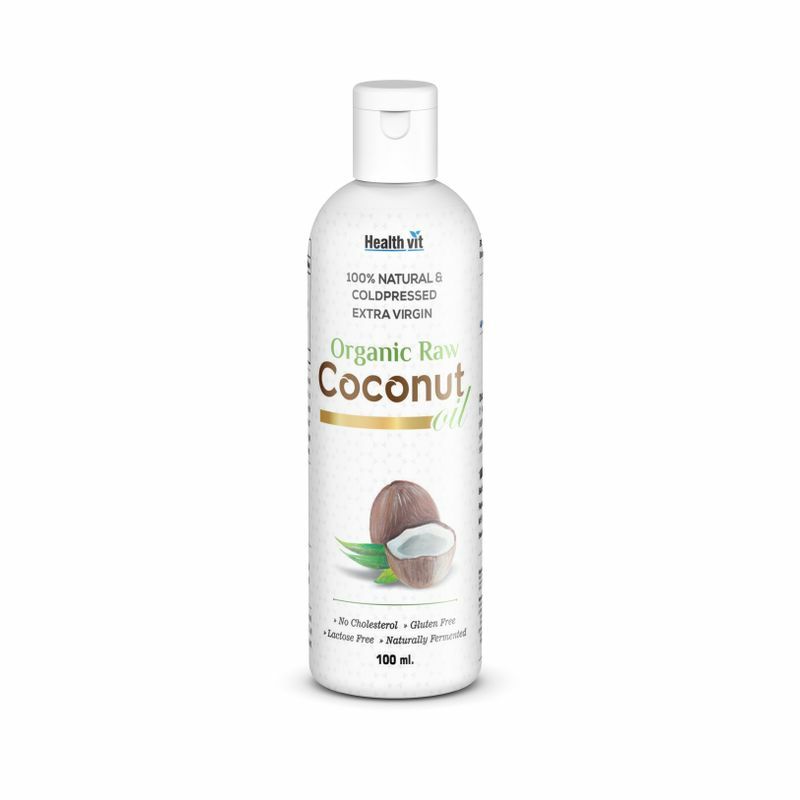 Healthvit 100% Natural & Cold pressed Extra Virgin Organic Raw Coconut Oil has significant nutritional properties that enhance multiple health benefits. The antimicrobial properties in it makes it a commonly used skin care oil for a variety of skin related problems. Made using the 'no heat process', this extra virgin coconut oil is a premium grade product recommended for raw consumption. For dietary purposes: Virgin coconut oil is rich in medium chain triglycerides which help boost metabolism and provide an instant source of energy. It also has a good quantity of lauric acid which helps fight bacteria, fungi and viruses and improves immunity. For hair care: This oil contains vitamin E which is an essential nutrient for healthy skin and hair. Vitamin E helps nourish and strengthen the hair. The antifungal properties of this oil helps fight dandruff and boost the health of the scalp. This oil can be liberally applied overnight or 1-2 hours before showering. For skin care: Virgin coconut oil acts as a natural moisturiser and is helpful for dry/rough skin. Using it to moisturise the skin will keep the skin looking soft and supple. It is packed with antioxidants, along with the medium chain fatty acids that actually help build cells. This slows down the development of wrinkles and promotes younger looking skin. It can also be used as a nappy rash cream on babies to prevent irritation caused due to rashes. For baby care: It can also be used as a natural treatment for cradle cap. The oil needs to be massaged into the baby's scalp for 20 minutes and it will work as a moisturiser and will loosen the cradle cap flakes, while nourishing the scalp. Please note: The benefits mentioned above are of general in nature and might vary from person to person. The product is free from parabens, sulphates and silicones. About the Brand: HealthVit is a herbo-nutra (herbal and nutraceuticals) segment of Ahmedabad based MNC West-Coast Pharmaceuticals delivering a wide range of quality healthcare products since last 46 years. The company offers wide range of dietary and nutritional supplements, medicinal products and various skincare products that help you lead a fit and healthy lifestyle. The company's motto is very simple: purest ingredients, stringent processes and high quality health products at affordable prices!